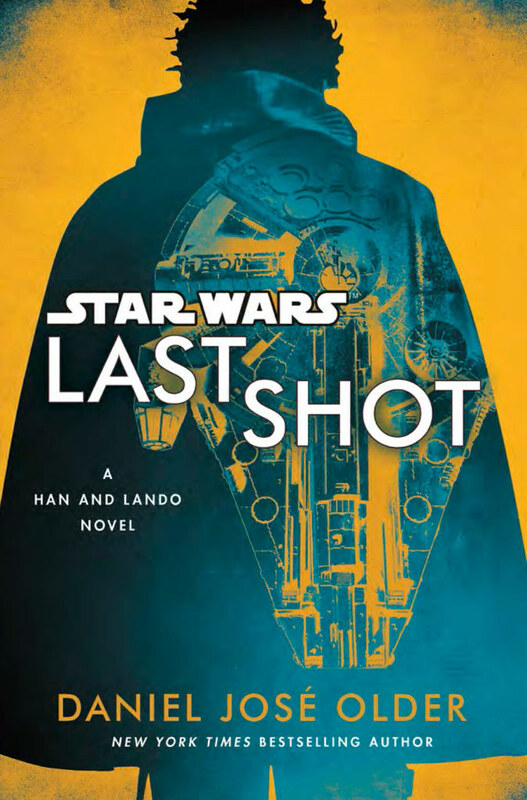 Last Shot is interesting in that it breaks the string of Star Wars movie novelizations Del Rey has been doing in order to focus more on tie-in books with original stories. Not only that, but it also tries to bridge the gap between the upcoming Solo movie and the sequel trilogy by splitting the story into different timelines. Some parts of the book take place before or after the events in the Solo movie, while other events take place after Return of the Jedi. Readers get a glimpse of Lando’s days journeying around the galaxy with L3, as well as Han pulling cons with Sana Starros. Plus there’s passages showing Han as a father with a very young Ben Solo. But all those glimpses and time jumps don’t touch on what the story is really about – and that’s the rights of droids. Going into Last Shot, I was very spoiler free, so I didn’t really know what I was in for. The book starts out on Bespin with Lando giving a tour of Cloud City and wooing a Twi’lek. Soon afterwards, he’s being attacked by murder crazed droids. Then the story breaks to follow Han Solo on Chandrila dealing with fatherhood, marriage, Ben and Leia. Things start to come together when Lando shows up, and soon the two of them are off on an adventure to find a Pau’an gangster named Fyzen Gor and an object called the Phylanx Redux Transmitter. But here’s where things get tricky. Instead of continuing with that story, things jump back ten years to follow Han on an old adventure he went on with Sana Starros. There’s also time jumps twenty years ago that explore the bad guy of the story, Fyzen Gor, and time jumps fifteen years ago that explore an adventure Lando and his droid L3 went on. Juggling those kind of time jumps can be tricky, and it can get confusing, especially if you put the book down and come back to it a couple days later. There is a common thread between all the time jumps, however it takes awhile for the plot to become clear as the author holds back a lot of the details until later in the book, even though there’s not much of a reward for the wait. Diving into a bit of spoiler territory, the crux of the story is that Fyzen Gor had an event that changed his life twenty years ago. Since then, he became obsessed with the idea of merging droids and sentient beings. While the idea of cyborgs in Star Wars is nothing new considering how much of Darth Vader was a machine, the twist here is that Fyzen wanted to replace droids’ arms with sentient beings’ arms, thus giving the preferential treatment to droids. Now given the circumstances in the book, it makes sense at first as sentient body parts are in supply and Fyzen could really use some fully functional droids. But as the story plays out, Fyzen’s idea grows into an obsession bent on revenge. He wants droids to rise up and kill their sentient masters. However, Fyzen doesn’t try to convince droids to do this, he never even asks the droids if this is what they want. Instead, he goes about engineering a way to commandeer them to do this, thus enslaving them to his own insane desire. It’s an interesting idea, but sadly it’s not one that’s very well developed. While the author does take some time to explore Fyzen Gor at different points in his life, he never shows how this mad plan would make any sense. First off, the very things he’s trying to help, the droids, would not benefit from killing off all their sentient masters. Secondly, his plan is someone limited in its scale. He can infect a lot of droids to turn them into crazy murder bots, but he can’t affect all the droids in the galaxy. On top of all that, his actions spawn a strange cult of Wire and Bone which also isn’t very well defined or explained. Putting that aside, the main focus of the book is Han and Lando. This is one of the areas where the book does a good job. There’s some exploration of both characters at different points in their lives, thus exploring what they might be like around the time of the Solo movie, and what their lives were like after Return of the Jedi. The characterization and the voice of both characters is pretty good and it’s easy to visualize the actors playing out the events of the books. Though it can get a little confusing trying to juggle the new cast for Solo for the flashback events, and then flipping back to an older Billy Dee and Harrison Ford for the current day events. Still, the voice and spirit of the characters is there. Furthermore, there’s some fun new characters that fill out the cast of the book. There’s a Twi’lek strategist that Lando thinks he may be falling in love with, there’s good old Chewbacca, a young hot shot pilot, and an Ewok slicer. Yes, there’s an Ewok character in the book. Funny enough, almost no one can understand what she says, so all of her lines are in Ewokese and very little of it is ever translated. There’s also an Ugnaught tech and a worrt. For the flashback scenes, as mentioned earlier, you get to see some of L3 (Lando’s droid in Solo) and Sana Starros (a character from the Marvel Star Wars comics). They all make for a fun supporting cast. The book starts off really strong with lots of interesting characters and situations. Unfortunately, in my opinion, the story gets a little muddled as it goes along. The side mission with L3 and Lando doesn’t gel that well with the main story, as it doesn’t make a lot of sense why they would do what they do. Without going over everything, they have a run in with Fyzen, but L3 and Lando don’t try to stop Fyzen at that point in time. Instead they just gather some data so they can stop him…15 years later. Then there’s some weakness with the Fyzen Gor plot logic. The whole point is that he hid a powerful transmitter that can somehow only be found with some records hidden in an old prison which he then manipulates Han and Lando into going and getting for him? Yet he also tries to kill Lando. And he mistakes Lando as being the one stole the device when it was really Han and Sana Starros. And for some reason he can’t just make another transmitter, or just hijack the holonet and transmit his murder droid message to the entire galaxy. There’s a lot of logic issues that aren’t well addressed. Part of the problem with the story is the pacing and the time jumps. By trying to break the story up into different eras and spread those pieces of the story throughout the book, it becomes necessary to draw out the mystery elements of the plot. This leaves some questions unanswered for too long. It also hurts the build up of the threat, the tension of the events that unfold, the development of Fyzen Gor as a villain, and hamstrings some of the logic of the plot. The book tries to do a lot of things, and by all means, there’s a lot of interesting ideas and elements that are explored and utilized. I loved the Toydarian soothsayer, the Ewok slicer, Lando trying to figure out if he was in love or not, Han trying to figure out how to be a good father, the New Republic dealing with the negative effects of disarmament, the line between droids and sentient beings being merged, and even the idea of a Gungan who breaks all of the previous stereotypes. All in all, there was some very cool stuff in this book. And overall, I did enjoy the book. But the book also had a lot more potential, and with a bit more fine tuning and oversight, I think it could have been a lot better. As is, I give Last Shot a three and a half out of five metal bikinis. There’s some great moments of Han and Lando in both the pre-A New Hope time period and the post-Return of the Jedi period. There’s some fun new characters and some fun action and adventure. It’s not the best canon novel out there, but if you like Star Wars books, it’s still worth checking out.